The U.S. Z.O.R.T. 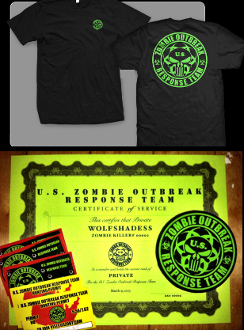 membership package includes a T-shirt, membership certificate, member ID card, 5 business cards, and our logo patch. Some items may be shipped separately. As a member of U.S. Z.O.R.T. you will be entitled to member only discounts, events, parties, special promotions, and V.I.P. access to our training seminars. You will also become part of a team, a family, waiting, preparing, and training for the zombie apocalypse.